This mod adds 2 blades for your blade hungry needs, the Katana and the Tanto. Not only does this add blades, but it replaces the recipe unlocking of the Hunting knife and Machete through a custom quest line I made. Fixed some Localization misspellings and added the Offer key when reading the Note to start the Quest Chain. Removed from older bundled post. 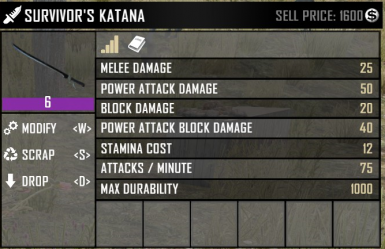 Uploaded Survivor Katana. 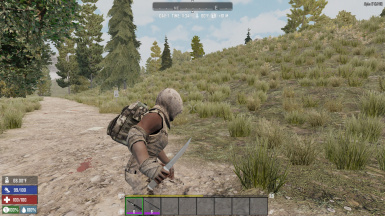 Changed description for Machete and Hunting knife to reflect the added dismemberment. Removed progression file to avoid mod conflicts. 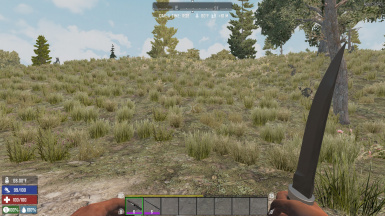 You can learn Hunting knife and machete through Hammer and Forge again. 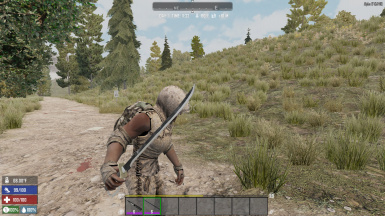 Changed base dismemberment for each bladed weapon, except bone shiv. I like to use Melee weapons. Preferably the bladed ones, like the Machete. I was slightly bummed out that TFP didn’t add any other melee weapons for late game. This Modlet adds 2 blades, the Tanto, which is the Japanese knife, and the Survivor’s Katana. I spent a good chunk of time just trying to find a model for a katana, but the traditional Katana just didn't feel right for this post-apocalyptic world. It takes YEARS to learn how to forge a Katana UNDER a master. So traditional style, just didn't seem to fit. SO, I took it upon myself to make one :D! Before anything else, I spent 2-3 weeks learning how to create my own 3D model with blender. When I finally got the gist of it, I went and searched the Googs and found the perfect picture to base the model off of. After much trial and error, I finally finished my first Model. 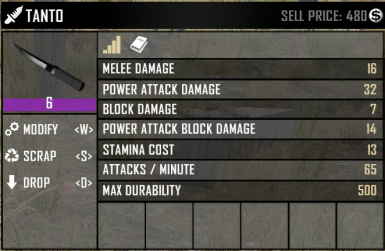 Its an interesting spin on a Katana that looks like it would be made by a survivor in a Zombie infested world. Added the Tanto and Survivor’s Katana. Tanto has a base dismemberment of 5% and 10% more animal harvest. Katana has a base dismemberment of 10% and 10% more animal harvest. Added in a quest chain to unlock each bladed weapon, including the Hunting Knife and Machete. Hammer & Forge still unlocks these as well. The quest chain “Way of the Blade” is started after you complete the Basic Survival quest chain. NOTE: ﻿﻿If you added this modlet on a saved game, you can craft the Quest, Way of the Blade, with 1 paper. Once you get the recipe for the Katana, you cannot read it again. Careful not to give up the last quest as the last quest grants you 5 skill points. If you want a modlet that simply just adds the Katana and Tanto, I may make it if requested enough. You of course can modify the one you download to suite your needs. I did it this way to try out my quest line method as it was quite fun to make :P. And if I make a simple method, I wont include a quest to grant 5 skill points. No quest mode is now an option. Removes quest line and the Katana and Tanto are unlocked by Hammer & Forge perk. NOT COMPATIBLE WITH EACH OTHER!!! I am now using a new method to add my entries the localization file for fancy naming and descriptions. Make sure the mod folder is in the correct location. Double click the Localization.bat file. A prompt will come up. If you are in the wrong place or if it is missing a file, it will tell you. When it prompts you for an option, type 1 then enter to backup the CURRENT localization file and make the change needed. That's it. There is an option to restore the LAST SAVED BACKUP FROM RUNNING THIS BATCH SCRIPT. It will restore what was backed up from first running this script. Watch the Video for instructions as well. 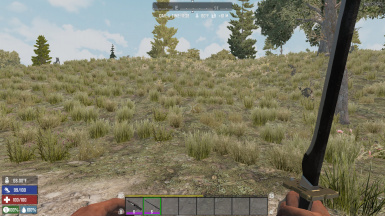 MP: Server AND Client side needed. PS. Some may notice that this may be a repost from the original Modlet list I have. I plan on posting bigger modlets like this separately and individually and simple modlets on that modlet list. The Added Bladed weapons will be removed from that Modlet list!